The eyes are, so they say. Here's the thing. For years, Andrew Henry and I disagreed about our eye colors. It seems an obvious thing does it not? He believed his eyes were brown. I believed they were not. How do you not know the color of your own eyes? I know we all see colors a little differently, but come on. I've looked at pictures from when he was little and, truth be told, sometimes they did look brown, yet sometimes they looked green. Perhaps they have changed? Can that happen? It took me YEARS to get him to see this. Here you go, look into my husbands eyes, what do you see? Mostly green right? He has finally agreed. He has green eyes with a little brown around the pupil. I think his drivers license says brown. Whatever. He did that before he realized I'm almost always right. It's a burden. Now, about my eyes. He thought they were blue. Again, years went by with him saying they were blue and me saying they were green. I looked through childhood photos to show you but, lo and behold, most of them show my eyes looking pretty darn blue. More changes? On any given day, depending on the weather, what I'm wearing etc., they can be blueish, greenish and even greyish. We agreed on a hazel type color. Take a look at my adult eye, what color do you see? They look pretty blue here, and they did when he took the photo. I said look at this photo and then look at my eye, are they they the same? He said they were. Huh. Today I looked, today they are way more green. 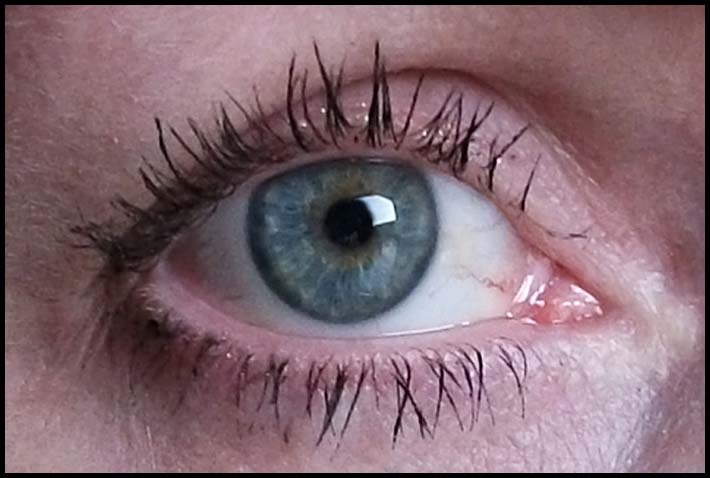 Just for fun, here is the daughter's eye. What color would you say she has? The thing is, I don't think any of us over here know which box to check on our drivers license! Tell me, what color do you think our eyes are? Dad = green. Mom = blue. Mine = grey. In that picture they look green to me, but I've seen Meg with blue eyes, and grey eyes. Sooooo.....? ;) But I have ever-changing eyes myself, so I totally understand how they go from blue to gray to green . . .
AH - has what I always thought was defined by hazel - a good balance of two colors, typically green and brown, that changed with surrounding colors. Woodsy and masculine. 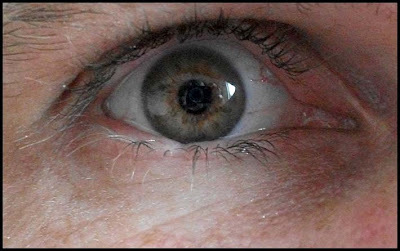 These are the eyes of my hubby as well. J- Mostly blue - but that early morning blue of spring. (My eyes do exactly what you described yours to do - except I have NO green at all - blues and greys here). M - beautiful translucent greenish- grey, like sea glass or coke bottles of yesteryear. Nevertheless - beautiful and soulful - all of them! Ok, we have this discussion in our house too! Scott says his eyes are brown, but they are really hazel just like mine! When we look into each others eyes we can watch each others eye color change to mirror the other! It's very cool! His drivers license says "brown" but last year when I was asked to renew his passport, I checked "hazel" - oops! I hope he gets back into the US later this week without any debate about his eye color! Andrew Henry-Amber Fantasy (his eyes are the same color as our granite countertop).Yours-Denim Lapis and last but not least, Daughters-Flourite.Anymore questions? Yours are blue in this pic. my friend deanna's sister does amazing work with a therapy call rapid eye therapy. when i first had it done 10 yrs ago i had never heard of it. now it is a therapy that is being used by rehabilitation professionals. hopefully our society is evolving to a place where we can accept alternatives to western medicine! a persons eyes are indeed the windows to their soul! if we can just open them up!